Olly Murs has announced that he will undertake his first major UK tour in the Spring of 2011. Olly mentioned the tour after performing his new single, Thinking Of Me, on last night's X Factor results show. Appearing on the show that made his name, Olly said "It's great to be back home...it's great to be in front of the judges again", before going on to mention the tour. After coming runner-up in the sixth series of X Factor, Olly Murs was signed to Simon Cowell's record label. Olly released his first single, Please Don't Let Me Go, earlier this year and it went straight to number one in the UK charts. Olly Mur's second single, Thinking Of Me, is released today and his self-titled debut album is due to be released next week. 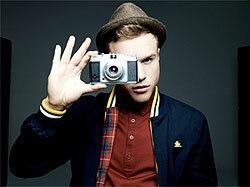 Olly will perform more than 20 dates around the UK when his tour gets underway in late April 2011. Tickets for Olly Murs UK tour will go on sale at 9am on Friday 26th November.